Gel Varnishes are easy to apply, and can be used on vertical and overhead surfaces without fear of runs, drips and sags. Brushes are not required, just a soft cotton cloth. 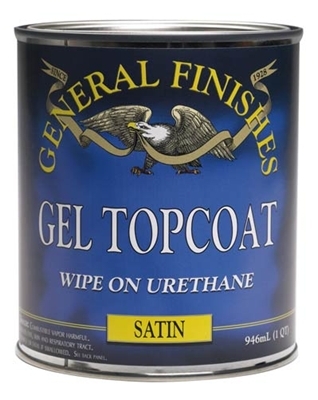 The Gel Topcoat is tack-free in minutes, and there is no sanding or buffing with steel wool required between coats. General Finishes Gel Topcoat is recommended for new wood projects and for refinishing antiques. Cures to a durable film, with slight ambering over time. Can be applied to bare wood and works well over dyed or stained surfaces. Apply by rag and wipe smooth. Great for handheld parts finishing, like intarsia.